Che Scientific Co. (Hong Kong) Ltd. is founded back in 1955 under former name "Hong Kong Scientific Company". Over the long 62 years of history, Che Scientific has built up as a credible, reputable and trustworthy scientific instruments and industrial equipment supplier to provide honest, straightforward services and high ethical business principles to our customers all over China, Hong Kong and Macau. Che Scientific distributes world class scientific instruments, industrial testing equipment, laboratory apparatus, optical instruments, measuring & controlling instruments, weighing scales & electronic balances, teaching aids for science education and occupational health & safety products to customers as Government Laboratories, Hospitals & Clinics, Public Department & organizations, Universities & Educational Institutions, Accredited Research Laboratories, Electronics, Toys, Textiles & Garments, Construction, Pharmaceutical and Food Industries. Che Scientific has set up the China Head-Quarter "Zhejiang Fortune Scientific Co. Ltd." in Zhejiang, a branch office in Guangzhou, and also the subsidiary "Shanghai Xiang Ke Scientific Trading Co. Ltd" in Shanghai, which coordinate all the sales and maintenance activities in China so as to provide a better service for our Chinese customers. 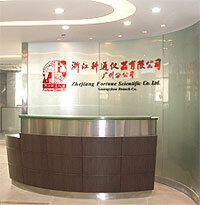 Zhejiang Fortune Scientific Co. Ltd. Guangzhou Branch Co.